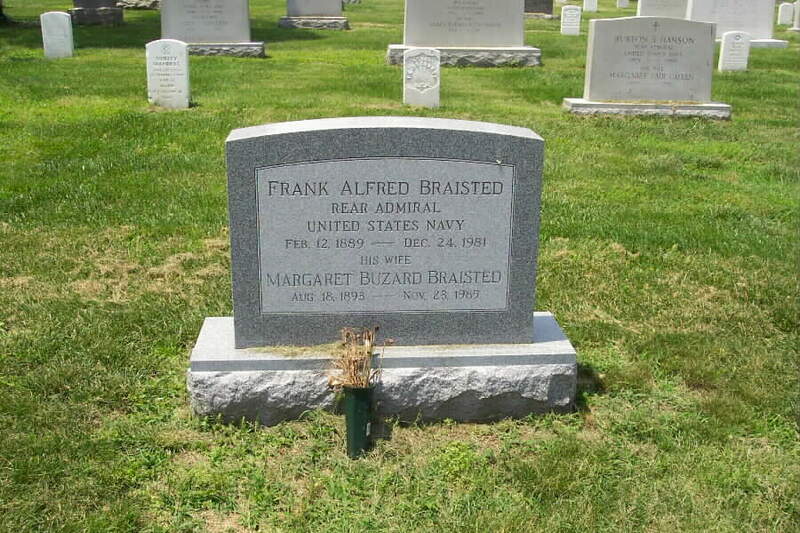 Frank Alfred Braisted, Rear Admiral, United States Navy, was born on 12 February 1889 and died on 24 December 1981. He and his wife, Margaret Buzard Braisted (18 August 1893-23 November 1985) are buried in Section 3 of Arlington National Cemetery. They are buried near Frank Braisted, First Lieutenant, United States Army (1828-1891). See below for additional information as to their relationships. I am related to the two men mentioned above and will explain how they are related to each other. First Lieutenant Frank Braisted (1828-1891) and his wife Helen Fisk Braisted (1831-1917) had a son: William Clarence Braisted (1864-1941) who became a medical doctor and served in the Surgeon General's office. He was a physician attached to the White House during the terms of William McKinley and Theodore Roosevelt. William Braisted and Frank Alfred Braisted Jr., both of whom are still living. Frank Alfred Braisted Jr. has a son, John Christian Braisted and a daughter Nancy. Frank Jr. has worked for the Smithsonian for over 42 years. William Braisted is not married and has no children. He is a retired university professor, and has written several books on naval history. Rear Admiral Frank Alfred Braisted (1889-1981) and I meet in the summer of 1976 while I was visiting Washington DC. We traced the family tree and did figure out how my branch of the family is related to the Admiral's family. When visiting Arlington in 1989, I found it is possible to see all three of the Braisted graves when standing next to any one of the three headstones. At least one other family relative is buried at Arlington, my grandfather's cousin. His name is Alva Jennings Brasted (note no "I") and was Army Chief of Chaplains in the 1930's. Alva Jennings Brasted was born on July 4 1876 and died in about 1965. He married twice and both wives are buried with him. I hope this will clear up the relationship issue for the two Frank Braisted's and fill in the missing generation. You have a great web site, keep up the good work.